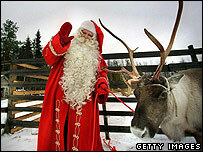 BBC NEWS | UK | Magazine | Did Coke really turn Santa red and white? Did Coke really turn Santa red and white? It's often said that Santa's red and white robes were the creation of a Coca-Cola advertising campaign. Is that true? He's got his own style and he sticks to it. Father Christmas is the universally recognised symbol of the festive season in his traditional robes. But the red suit and hat with the white fur trim have given rise to the belief among some that Santa's togs were dreamed up by canny ad men who recast him in the soft drink maker's corporate colours. But while there's some truth in the suggestion - Coke ran a campaign for 30 years featuring a jolly fat Santa - his colour scheme owes more to ecclesiastical vestments than a brainstorm on Madison Avenue. The colours are widely thought to derive from the original Saint Nicholas, who was the Bishop of Myra in the 4th Century. Red and white were the hues of traditional bishop robes, although some historians argue that he originally dressed in different colours. He was famous for his kindness to children and generosity to the poor. After he died the legend of Saint Nicholas grew and he is still remembered in some countries on 6 December. "To this very day St Nicholas arrives in Holland each November, dressed in a bishop's vestments," says a spokesman for the St Nicholas Society. "He rides through the streets to the enjoyment of thousands of onlookers, to begin his investigation into the behaviour of the children." In medieval England and for centuries afterwards, the figure of Father Christmas represented the spirit of benevolence and good cheer. In the 19th Century Dutch emigrants took their story of a legendary gift-bringer called Sinterklaas to America, where he eventually became known as Santa Claus. But while the names and legends may differ, there was little variation in the red and white outfits worn. However, over time the bishop cloak and mitre were replaced by the fur-trimmed suit. There are records of Santa wearing various coloured costumes, but red was by far the most popular and became known as the quintessential Father Christmas outfit. "Father Christmas is an evolutionary creation, influenced by folklore, legend and religion," says Tom Glamon, whose research into Santa will win him the envy of children the world over. "He didn't spring to life at a certain time, fully formed and wearing a red and white suit. It wasn't really until the late 19th Century that the image now recognised across the world became set." In recent history the red and white suit has been fixed and standardised by certain publishing events and advertising campaigns. Between 1863 and 1886, Harper's Weekly magazine ran a series of engravings by Thomas Nast. He developed an image of Santa very close to the modern-day one. From these engravings the concept of Santa's workshop and the idea of writing letters to him also developed. Coca-Cola's involvement kicks in in the early 1930s when Swedish artist Haddon Sundblom started drawing ads for Coke featuring a fat Santa in a red coat trimmed with fur and secured with a large belt. His drawings were used in the company's festive advertisements for the next 30 years, well and truly cementing the image. Of course, one sure fire way of putting the Coca-Cola story to rest would be to ask the man himself. Unfortunately, this time of year finds him so busy he has been unable to return our calls.